This gorgeous 7mm ring is made out of Damascus Steel. Our rings are made by the best jewelry artisans that the industry has to offer, and each ring is finished by hand. These rings have a comfort fit band to ensure that the ring will rest comfortably on your finger throughout the day, and is custom made per order to ensure that it fits you perfectly! This ring also has a two-tone finish giving it the perfect finished look. 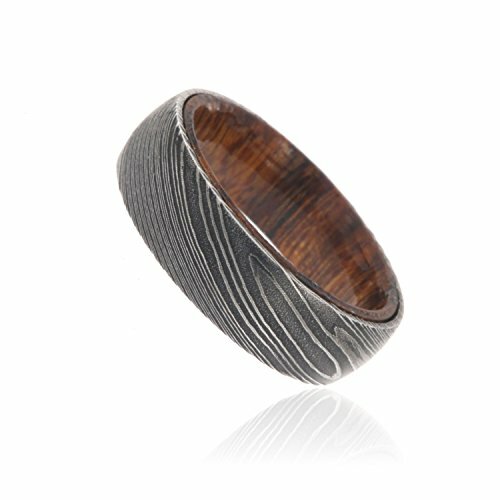 This ring also features our Iron Wood inside sleeve for optimal wearing. Let us make you a ring that is unique to your style, something you can cherish for a lifetime! With a quality and price that is unbeatable, you can't go wrong when you order today! If you have any questions about this product by The Jewelry Source, contact us by completing and submitting the form below. If you are looking for a specif part number, please include it with your message.